A penchant for scoring and a feisty personality made Allen Iverson of the most captivating players in the league for over a decade. While his individual success never led to a title, Allen Iverson is remembered as one of the top guards of all-time despite a rollercoaster career. 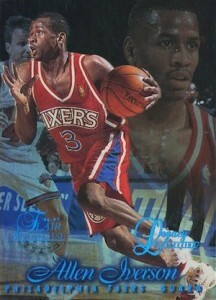 Along the way, plenty of Allen Iverson cards were released and we look at some of the best options below. 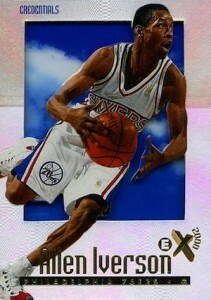 Shop for Professionally Graded Allen Iverson Cards on eBay. 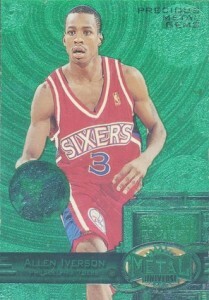 Starting in 1996, Allen Iverson was heavily featured in card products and his official rookie cards remain some of his most popular. 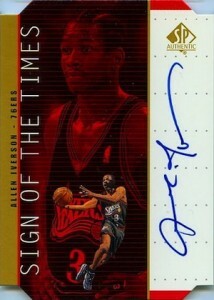 The first autographs for AI were found in 1996 Collector's Edge and Score Board, but collectors would have to wait several more seasons for his earliest NBA autographs. 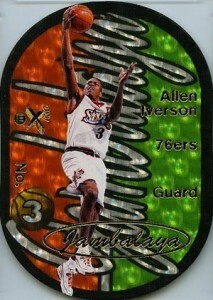 Many of the top cards for Allen Iverson are his rookie cards, parallels and inserts found in 1996-97 NBA products. Despite being a true NBA star for many years, Allen Iverson autographs are simply not as common as other top players from the period. After signing sporadically during his active career and stopping near the end, Iverson autographs have returned in more recent products, but still in a limited nature. This has resulted in a strong market for any of his pack-pulled autographs. Click on the images or listings to shop for cards on eBay. Links in the individual descriptions go straight to detailed product profiles or guides. Premium dual-image photography and a quality finish help 1996-97 Flair Showcase stand out. 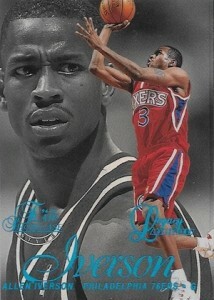 But the strong values for the Allen Iverson rookie cards come into play thanks to the Legacy Collection parallel. Each of the three tiers, known as Rows, has a separate parallel that is numbered to 150. 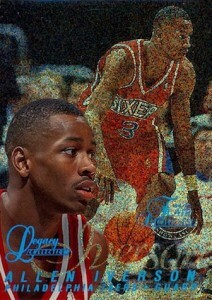 While it could be a pre-sneeze image, the most popular overall base rookie for Allen Iverson likely showcases an example of his great passion for the game. Already one of the rarest products of the year based on the retail-only release, the limited Refractor parallel in 1996-97 Topps Chrome takes things to the next level. The unique design and sensitive nature of the product makes 1996-97 E-X2000 one of the most captivating options of the 1990s and very tough to find in high grade. 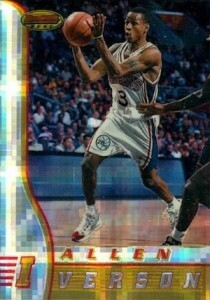 While the base Allen Iverson rookie card is an appealing budget rookie card, the Credentials parallel, numbered to 499, is one of his most-pursued cards. Like the previous three examples, the 1996-97 Bowman's Best base card for Allen Iverson is a popular rookie choice, but the real draw is the rare Atomic Refractor parallel. While it is not numbered, the distinct Refractor design makes the card very easy to distinguish from the base. Although the simple die-cut is not nearly as ornate as some of the other 1990s inserts, Jambalaya is a cardboard legend. The rare cards fall at 1:720 odds and are further compounded by the size of the 15-card set. Arguably the king of all 1990s parallels, the Precious Metal Gems were one of the first to take off with collectors. Covered in foil and limited to just 100 copies, Allen Iverson collectors are treated to a chase within a chase as the first ten cards in the print run feature green foil while the final 90 are red. 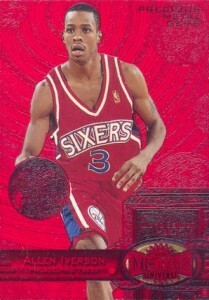 Star Rubies are another valuable parallel from the early part of Allen Iverson's career and are even more rare than the PMGs. The red foil logo and text is easy to overlook given the elaborate design. 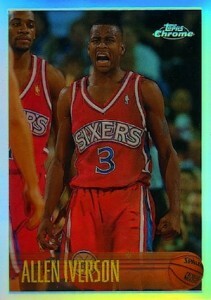 The limited Allen Iverson card is numbered to just 50. The earliest Allen Iverson jersey card came in 1996 Press Pass, but collectors have shown much more interest in his first NBA jersey card. 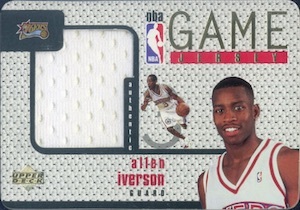 Part of the iconic Upper Deck Game Jersey insert, Allen Iverson's card contains a piece of game-worn jersey from his rookie season. That alone makes it a top option, but the tremendous odds (1:2500 packs) further enhance the value. One of the first NBA autographs for Allen Iverson also happened to be found in one of the top signed inserts in basketball collecting. 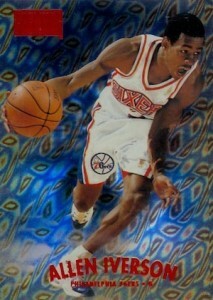 After missing the first two editions, Iverson was included in 1998-99 Skybox Premium Autographics and he signed the cards in both blue and black ink. Another early autograph for Allen Iverson, Sign of the Times Gold was the rarest tier of the SOTT inserts in 1998-99 SP Authentic at 1:864 packs. The on-card signature is always going to get the attention of collectors and the die-cut design means high grades are not easy to find. While his inclusion in the set might have been premature at the time, Allen Iverson has firmly established himself among the legends of the NBA. 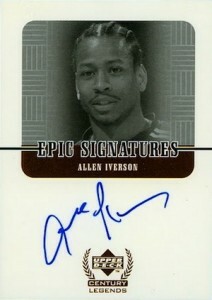 Both modern and simple at the same time, the Epic Signatures card from 1999 Upper Deck Century Legends is one of the top Allen Iverson autograph cards. 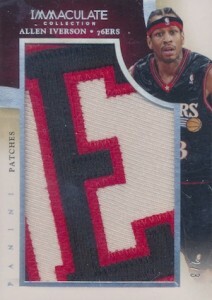 Allen Iverson collectors had several premium patch options during the 2000s, but the overall size and quality of the patches has seen a monumental increase in recent years. This is especially evident in the new high-end options from Panini, including Flawless and Immaculate Collection. The low print runs and impressive patches have resulted in a strong market for the premium cards. 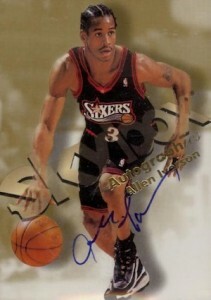 The autograph cards for Allen Iverson during his active career were not exactly plentiful and later shifted to sticker autographs like the rest of the hobby. However, in recent years, the desire for on-card autographs has finally been acknowledged and Allen Iverson autograph cards have been part of several high-end releases. While most feature very limited print runs, the high values and popularity is very evident whenever they surface. 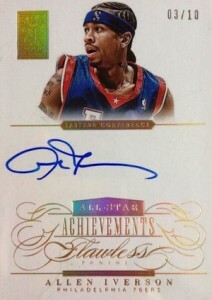 2013 Upper Deck All Time Greats Allen Iverson Autograph Card #9 12!! !